As mentioned in an earlier post, I decided to hold a reading challenge for my students during the month of April. 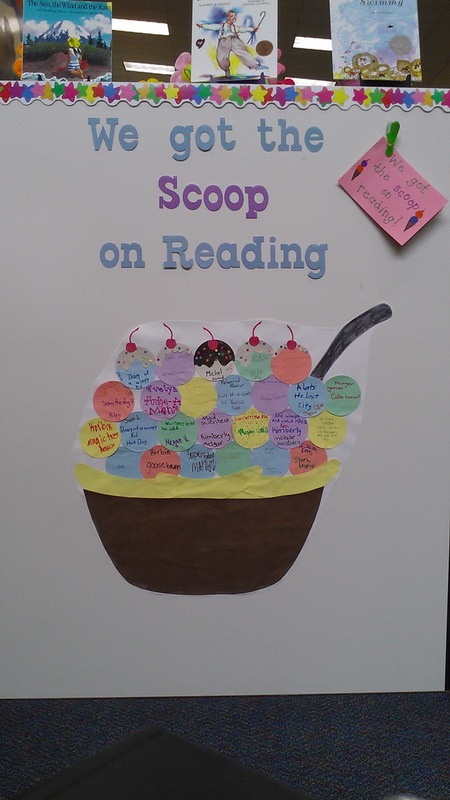 I called the challenge "Get the Scoop on Reading". 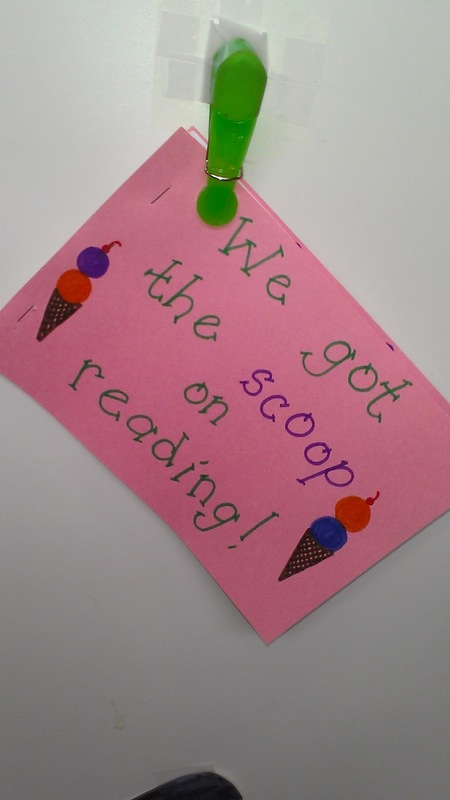 For each chapter book a student read during the month of April, he could earn a paper ice cream scoop to be displayed on our May bulletin board. I decided to make this challenge a little more difficult than the one I held in November, in which my students could read any book and then fill out a book die-cut to place on our turkey's tail. This being the end of the school year, I decided that the books needed to be chapter books. I also added a requirement, which was that the students had to fill out a summary sheet about the book and turn it in to earn their ice cream scoop. 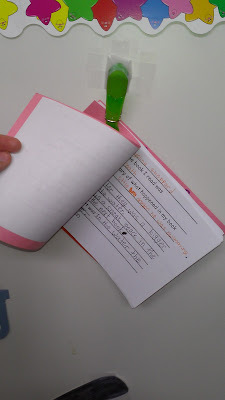 This enabled me to see that they really did read the book, and gave them some practice summarizing. I included some basic rules, as well as a sample of the summary sheet. This sheet was very basic--I just typed it up in Word one afternoon. All it asked for was the student's name, the title of the book, what happened in the beginning, middle, and end (which is how we've been learning to summarize), and the student's favorite part of the book. 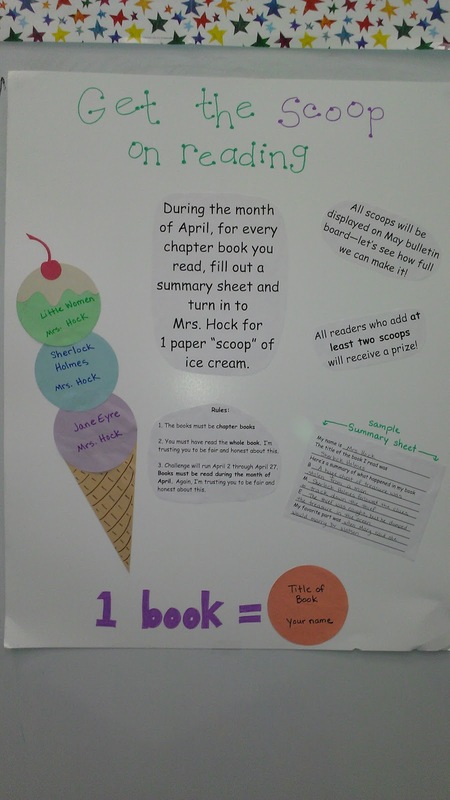 One chapter book earned the student one scoop of ice cream on the display, but I decided to up the ante a little and give a prize to every student who read two or more chapter books during the month of April. These stricter requirements meant that my students ended up reading fewer books than they had in the November challenge, but they were reading more difficult texts and were required to remember them better. All in all, I am happier with my stricter challenge rules. I love seeing my students rise to the occasion. The finished display is pretty cute. I like having displays that also showcase student work. The summary sheets they turned in were so good that I decided to keep them and turn them into a little book. I taped a clip up on the display so the book of summaries can be taken down and admired. (Probably only by me, but it will be nice on those days when I feel like my students aren't "getting it"). I plan to leave this display up for the rest of the school year, so there will be no new bulletin board posts for a while. I think this reminder of the hard work of my students (and myself) is an appropriate display to finish out the year with.